She is working with the actor after 10 years. Priyanka Chopra, who has been working in international projects back-to-back, is set to star in Bollywood film 'Bharat'. She is looking forward to work with Salman Khan after a gap of 10 years, and with director Ali Abbas Zafar. The 'Quantico' actress said in a statement: "'Bharat' it is! I'm looking forward to begin shooting this film and working with Salman and Ali again after a considerable time. "I've learnt a lot from them in our previous collaborations and am excited to see what this one has to offer." Priyanka has worked under Zafar's direction for 'Gunday', and she also teamed up with Salman in films like 'Mujhse Shaadi Karogi' and 'Salaam-e-Ishq'. Priyanka has thanked "all well-wishers who have been so patient and supportive" for the constant support. 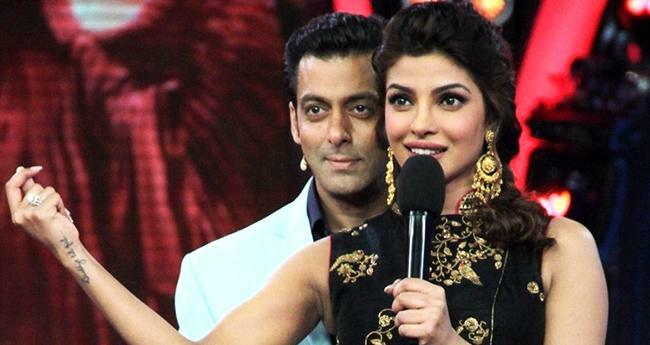 Zafar, who has been busy preparing for the movie, is happy that 'Bharat' marks Priyanka's homecoming to Bollywood after having proven her range as a performer in Hollywood films and a blockbuster global TV show. 'Bharat' is rooted in India and its culture despite it spanning over 70 years and set across various countries of the world. "Priyanka is the biggest Indian artiste internationally and she is a perfect fit for the film. Priyanka brings in outstanding acting, as well as incredible international appeal, to make the scale of the film bigger and even more global," he added. Zafar and producer Atul Agnihotri travelled to New York to meet Priyanka and gave her the narration of the film. Zafar calls Priyanka's character in the film the "soul" of 'Bharat'. "As the love story in 'Bharat' is very mature and quite subtle, we needed an actor who could portray this in the best possible way. "Her character is the soul of the film, and throughout, she stands shoulder to shoulder with Salman Khan in the journey. She is the catalyst in the film's most important turning point," he added. 'Bharat' has started its prep in London, after which director Zafar will move to Spain, Poland, Portugal, and Malta. The film will feature Salman sporting five different looks spanning 60 years, wherein a crucial part will showcase the actor in his late 20s, looking much leaner and younger.